Before he built the Alley Theater in Houston or the Harlem School of the Arts in New York City, architect Ulrich Franzen designed residential houses. 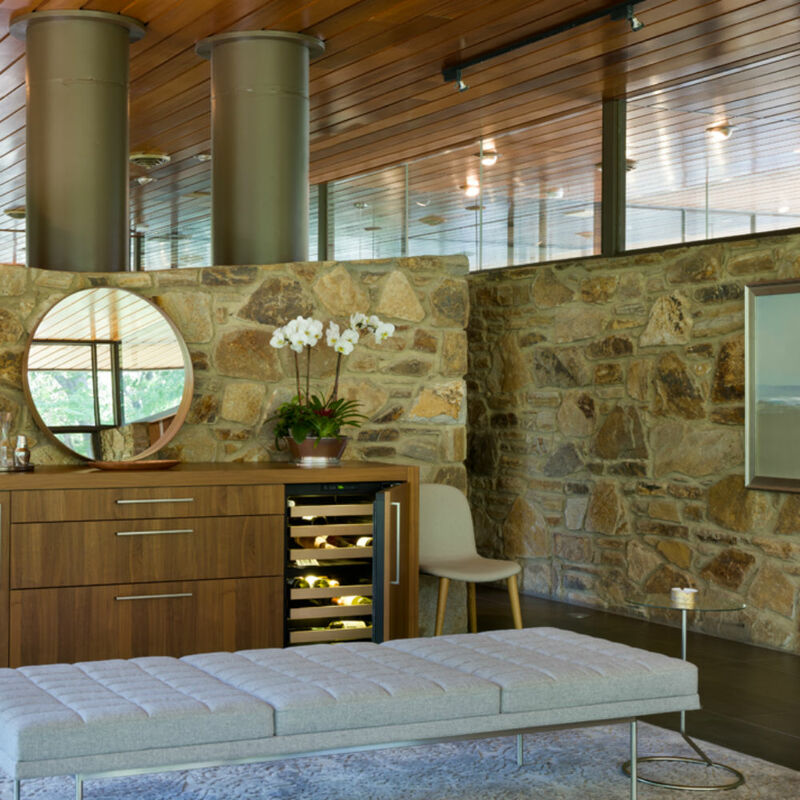 His designs featured clean lines, single levels, sliding glass doors and light-filled spaces. One of these homes is on Gibson Island, Md., and remains unique in many ways. 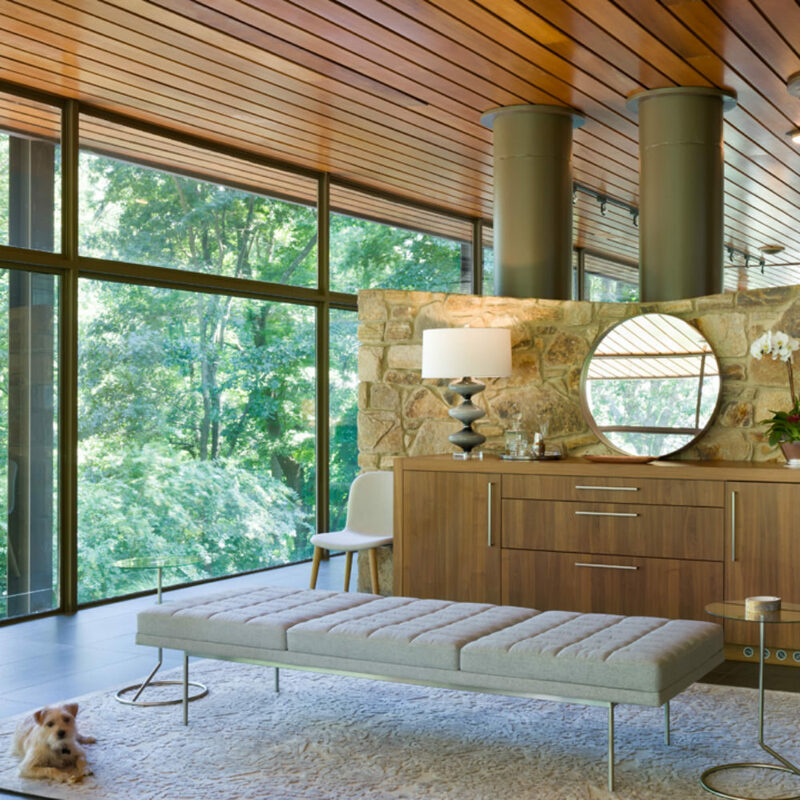 The clients wanted to maintain the integrity of the 1962 design while opening up the house to the surrounding landscape. 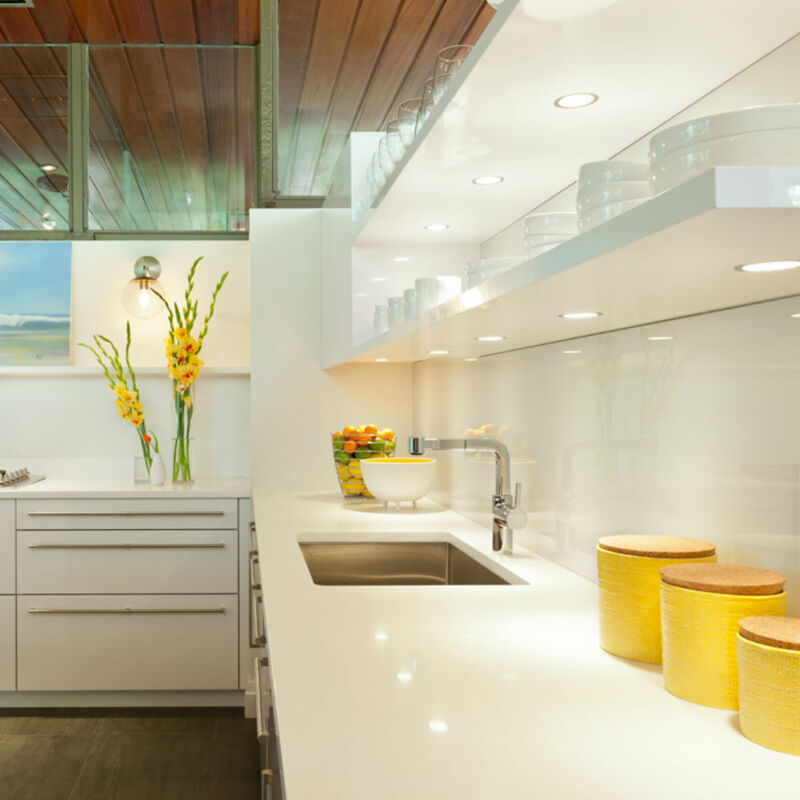 The home also needed modern upgrades, like an expanded kitchen and a reconfigured layout. 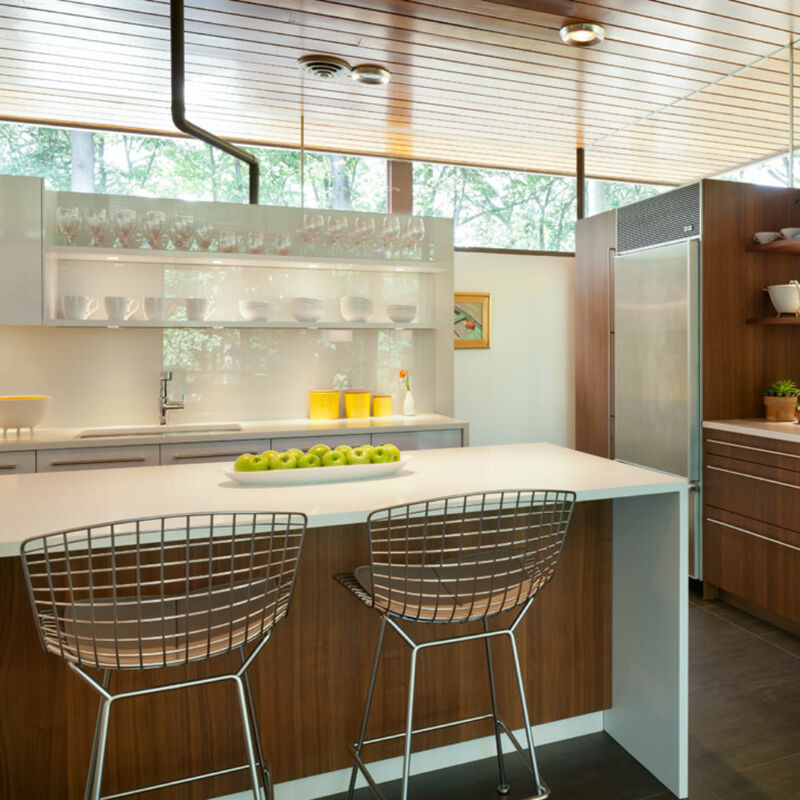 “When the house was built, kitchens were second in importance to the public areas of the house and were considered more service areas rather than places you wanted to spend time in,” explained Dillon. The first step in opening up the kitchen was to move a main wall back two feet to make room for an island. 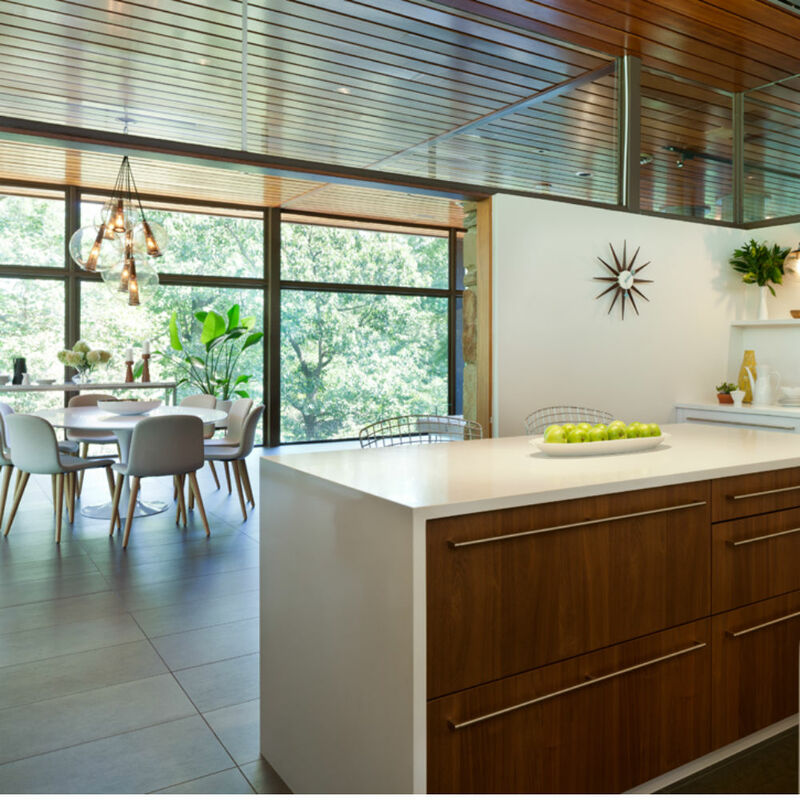 This small but significant change allows for gathering space and seating around the island and establishes the kitchen as one of the main areas of the home, along with the living room. 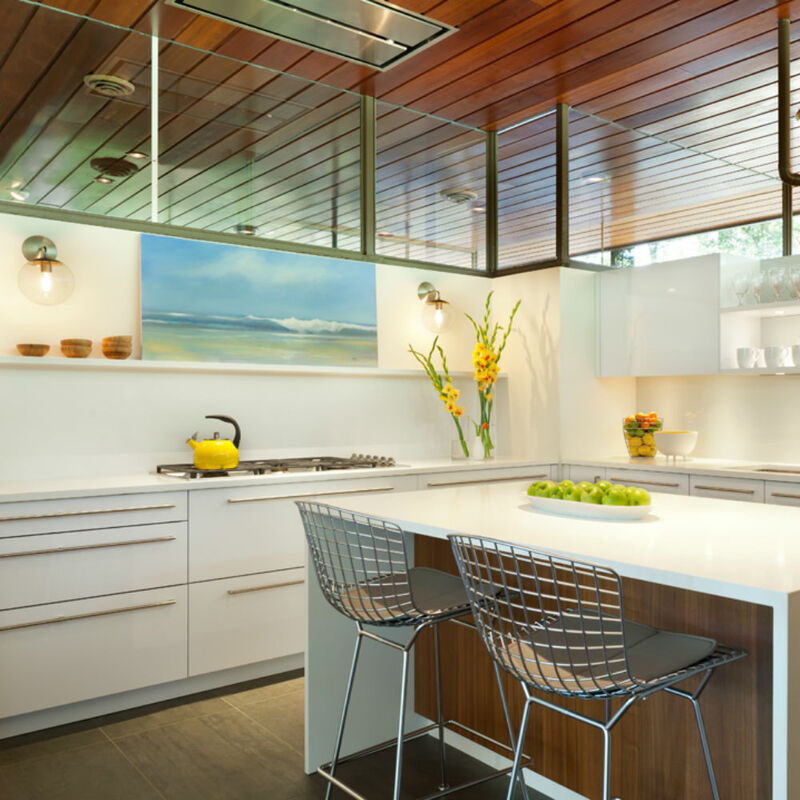 Even with all the changes going on in the house, one major aspect of the original design was maintained: the extended ceiling. All of the interior and exterior walls are just at seven feet tall, and then glass extends another three feet up to a mahogany ceiling. 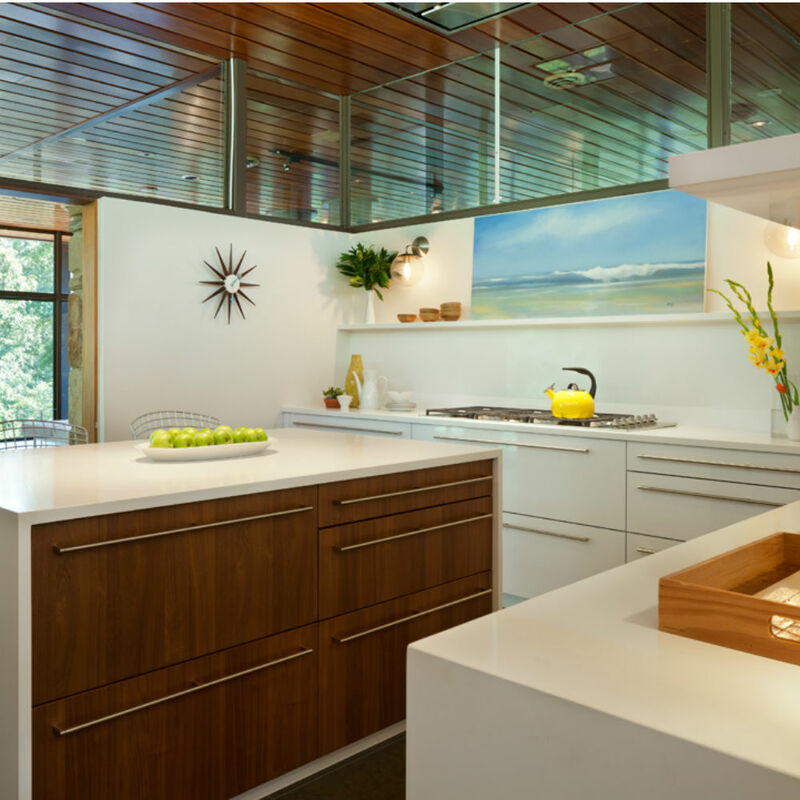 With this design, one can stand at one end of the house and see the wood ceiling all the way through to the other side. According to Dillon, it was difficult to maintain this look while updating the home. Also hindering the open ceiling was a large professional-style, double-vent hood the previous owner had installed. Within the airy design, the steel chimneys were huge eyesores. 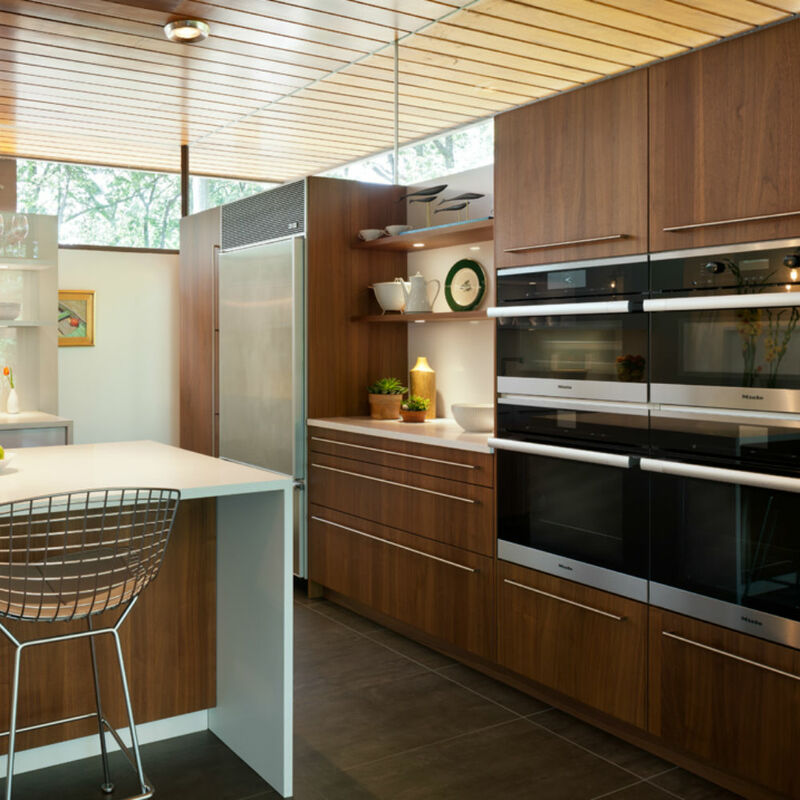 While the height of the kitchen was fixed, the two-ft. expansion created more problems. When the sink in the kitchen was moved back, the plumbing chase – or a wall with interior piping – was exposed going up to the ceiling. It had to take on a new shape to accommodate the extension, and while Dillon considered several ways to cover it up, in the end the piping was left exposed. “I think it adds some nice industrial character in the house and probably disappears more than it would have had we tried to conceal it,” she said. 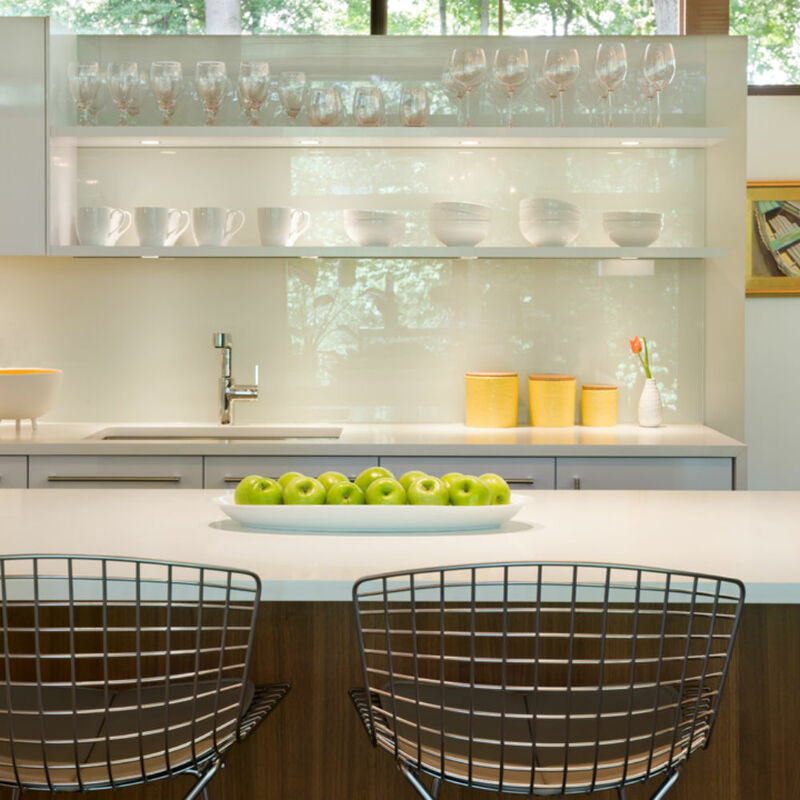 Although pendant lights arguably would have furthered the interior lighting, there were concerns that they would compete with the contents of the open shelving and make the kitchen appear cluttered. But without pendants, the design team was concerned that the overhead lighting would not be enough to keep the room bright. The solution was to add some decorative sconces on the wall above the cooktop. 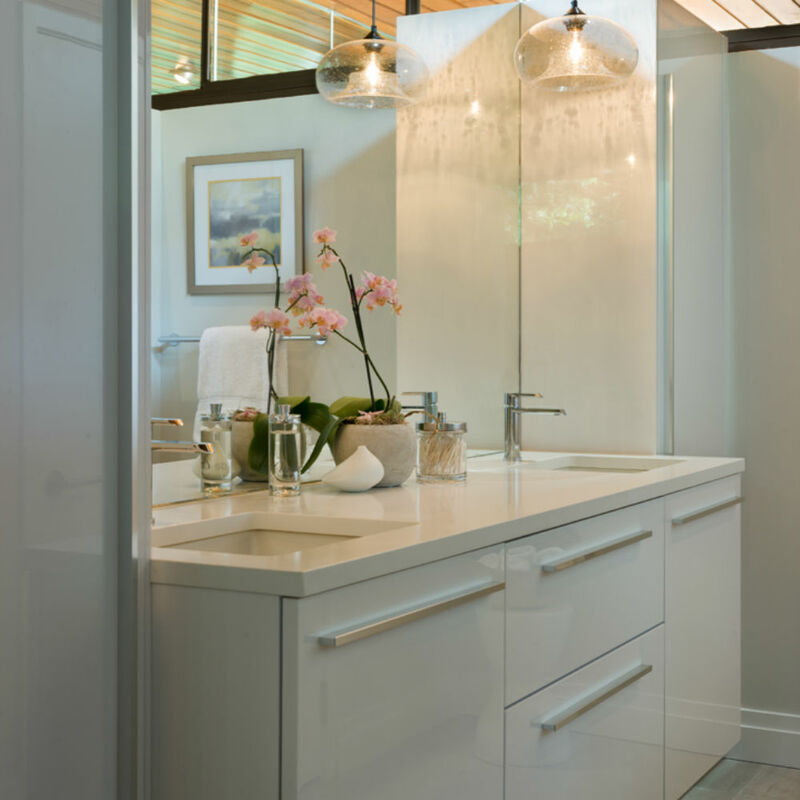 With the sconces and the LED lighting built into the cabinetry and shelving, the perimeter of the room retains its brightness, and the area has even lighting.